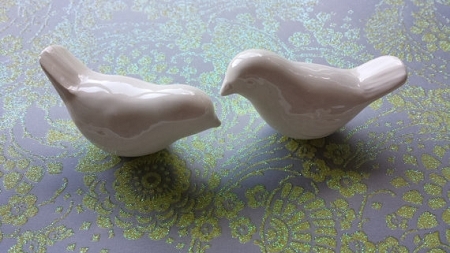 Love Birds for home decor and cake toppers. Elegant Wedding cake toppers white love birds vintage design for your wedding cake and home decor. Elegant white little birds cake topper vintage design for your wedding cake and home decor. In stock and ready to be glazed in your color choice. The second picture is in ivory color, but shows the two different styles of the bird set* I only use food safe glazes too! Shown in white..more like eggshell. Price is for two! White Gift box included free with every purchase, and ribbon to match color choice. They measure across by about 3." high 1.5 " by 1.5" wide 7.6cm X 3.8cm Also available in your color too! Hand made in the USA by me! I pour these from a vintage mold, clean fire to bisque, then glaze again, with the color.